The Satin guinea pig is so named because it has a glossy, reflective coat that is fine and silky. Its distinctive feature is its hair type, it has a hollow hair shaft which allows the light to pass through it and give it its unique sheen. The Satin is another relatively new breed, being first imported from America in 1986. The Satin gene is a recessive gene, and Satins should never be bred to each other, but mated with a solid colour, or a solid colour carrying the satin gene. 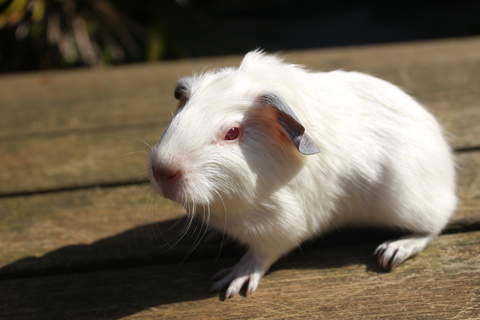 Satins do not tend to be as long-lived as other breeds of guinea pigs, but they are popular as they are so attractive. Almost every self colour has now been satinised. Attempts have also been made to satinise other breeds too, such as the Agouti and Dalmatian. I have a satin guineapig, and have had him for 3 years now. No health problems so far (touch wood). He's very friendly and social and is fearless around the house. Loud noises will startle but he often investigates after he makes sure it's safe to do so. My guinea pig lives in a hutch in my room and has a play pen in my office as he lives alone. He did have a hutch mate but continued to fight viciously with him. So for the safety of both the other was given back to the breeder. If you have a lot of time and love to give, these critters love are social and will talk to you all day, they love being brushed and are happy to sit on your lap so long as they are given regular pats and treats. This is a good pet for a person who has never owned a guinea pig before. They are shy at first but will worm up to you after awhile. If your kids are younger than nine never give them this breed of guinea pig.